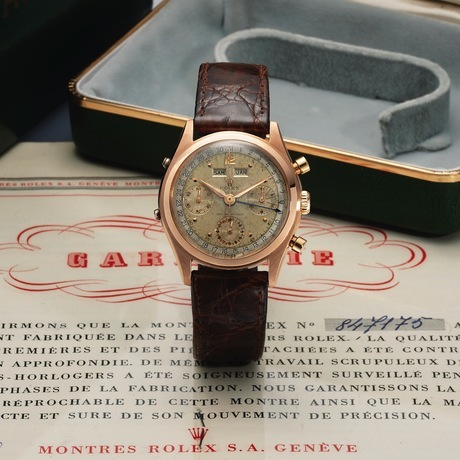 Antiquorum Auctioneers will soon be hosting their “Important Modern & Vintage Timepieces” auction in Hong Kong. 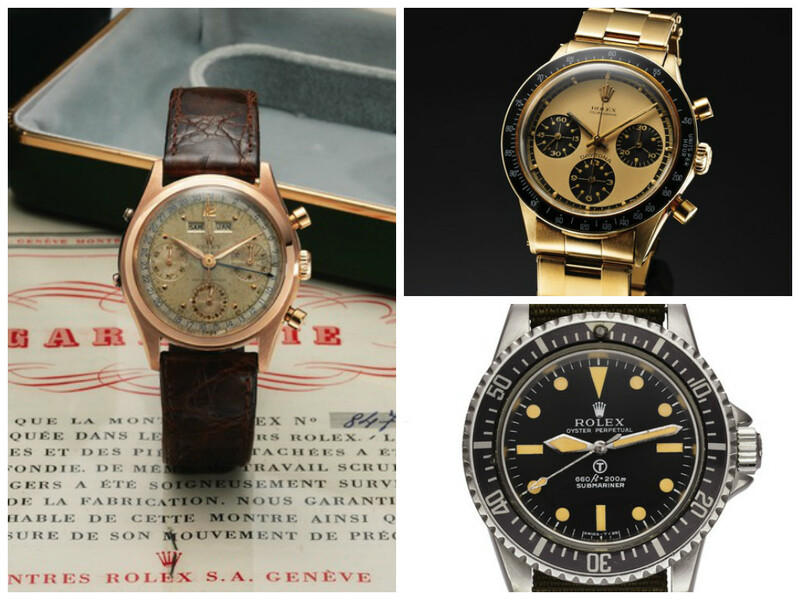 Slated to take place July 9, 2016, the Antiquorum sale has a handful of very sought-after vintage Rolex watches. Among the lots are three extraordinary vintage Rolex watches that would be considered a “grail” for many serious collectors: Rolex ref. 6036 “Jean-Claude Killy” in pink gold, Rolex ref. 5513 “Milsub”, and Rolex ref. 6241 Daytona “Paul Newman” in yellow gold. Here we take a closer look this trio of Rolex vintage beauties. Nicknamed after the legendary skier, Jean-Claude Killy, the Rolex ref. 6036 is one of five references that make up the family of Dato Compax watches. Some of the most complicated timepieces ever produced by Rolex, the Dato Compax watches include the chronograph and triple calendar functions. Made in 1952, this particular Rolex ref. 6036 “Jean-Claude Killy” is exceptionally rare as it’s estimated that only 144 examples of the ref. 6036 were ever produced in pink gold. The 36mm pink gold case houses a two-tone silver dial with applied pink gold pyramid-shaped indexes and matching pink gold alpha hands. The outer track with blue Arabic numerals indicates the date, while the day and month are revealed via the duo of apertures framing the Rolex crown at 12 o’clock. 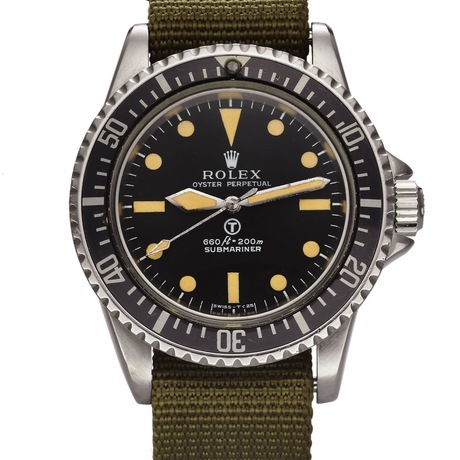 In the 1970s, the British Ministry of Defense commissioned customized Rolex Submariners to be issued to the Royal Navy divers and the Rolex ref. 5513 “Milsub” was born. The ref. 5513 includes several distinct features that distinguish it from a standard Rolex Submariner. On the dial of the stainless steel Milsub, there’s the large letter “T” within a circle to indicate the existence of tritium luminescent, oversized sword-style hands, and the bezel is calibrated to the full 60 minutes. Furthermore, the 40mm case was modified to accommodate a NATO strap rather than a bracelet, the caseback was engraved with MOD issue numbers, and the inside of the caseback was engraved with the full serial number. This particular Rolex ref. 5513 Milsub from 1972 is exceptionally rare as it’s a “full-spec” model with the correct hands, dial, bezel, and caseback. Within the already extremely coveted Daytona “Paul Newman” chronographs, the yellow gold versions are exceptionally desirable not only for their looks but for their rarity too. 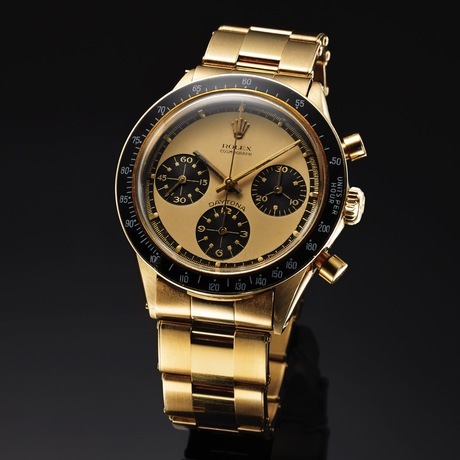 This particular Rolex Daytona Paul Newman ref. 6241 from 1969 is crafted in full 14k yellow gold from its 37mm Oyster case to its riveted Oyster bracelet. The champagne dial is perfectly accented with the three black registers, black outer track, and black acrylic bezel. The yellow gold ref. 6241 Paul Newman is considered one of the rarest Paul Newmans with only a few hundred models produced from 1966 – 1969.